Pest Expert Rat Glue Traps, or Rat Glue Boards as they are also known, provide a fast and effective method of rodent control, making them particularly useful in situations where other methods have failed. Rat Glue Traps are widely used by professionals pest controllers, although generally considered to be a last resort method for dealing with rat infestations. While many poor quality, imported glue traps with weak adhesive are available in the UK, we have chosen to only stock the professional standard, industrial strength Pest Expert range of Glue Traps, in order to guarantee our customers outstanding results. 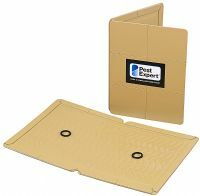 Pest Expert Rat Glue Traps / Rat Glue Boards are a professional-standard product guaranteed to deliver fast and effective rodent control, particularly useful in situations where other methods have failed or are unsuitable. The heavy-duty plasticised board with industrial strength adhesive ensures effective trapping.